We make WordPress themes, HTML templates and apps to help you stand out and make an impact. We have more than a decade of experience on Web Development. Use the handy filters below to search our Items categories. Since there is not an "all the above" category, I'll take the opportunity to enthusiastically congratulate you on the very high quality, "user-friendly" documentation. I've been on Envato for over 8 years and purchased ~250 items. YOURS is head and shoulders the best - most useful documentation EVER! And given the extensive pages and features you've provided; I can't thank you enough for both. Exceptional. I don't know which one to select as main reason for my 5 star rating, lot of good things in this theme. I am really impressed with the features and quality of this theme. Also the support is excellent. Appreciate the developer for their creativity. If they can give discount on App integration for their existing customers, it would surely be a value add. Great theme, love the demos available. The support team is awesome too. Thanks a lot for providing such a theme. The theme design is very nice and friendly to setup. Support is cooperative they tried to solve all your issues related to the theme. Good luck for more sale guys. The theme itself is very flexible at a great price, but customer service was fast, friendly, and discovered my issue quickly. I highly recommend this theme! I love your Webster template, bought it. And when I see this theme, I sure it has great design like Webster! Just want to say thanks for your great intro price offer! If you continue work for it, I sure CiyaShop will become a bestselling monthly soon! Easy to customize. Sections can be moved and template works still great. Many different possibilities of content arrangement. My website looks great and works fine. Thank you! Apart from the really excellent design and code quality - I had some support queries that were answered quickly and efficiently. I would recommend highly. Really great theme with massive potential. Neatly organized code and brilliant flexibility. Thank you guys, please keep up the stunning work. Дуже гарний шаблон, давно хотів купити, була знижка і купив, і ніколи не пожалів, рекомендую всім покупайте! Asked for information and received it EXTREMELY quickly. Great layout - good code - great price! What else can you ask for! Not only is this the only theme we considered based on functionality and features. But also the after sales support is amazing, just a quick request for a change and resolved within 8 hours. GREAT theme! Super easy to customize. Tons of options! Excellent documentation. One of the best themes I've ever used! Worth every penny! The support is really great too! Thanks, Protenza! You guys rock! 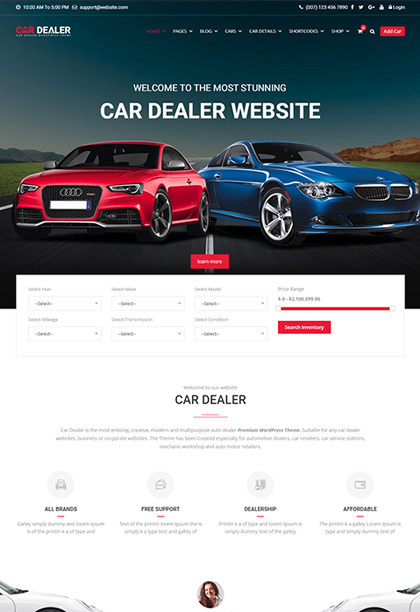 Nice theme, you can have everything you need for a cars shop, and the support is really good and fast. Thanks for an amazing theme. It's amazing! The author not only helps you with theme setup and questions about the functions, but he actually guides you in every tricky part. Absolutely professional and very kind person. I'm his #1 fan! Awesome customer support plus the theme works very well on all aspects: customization, very well coded, support. You will be very satisfied on every aspect of this theme. Thank you! Very profesional support. They made changes i need very fast and profesional. They even go further as i need so i'm very pleased with their profesionality. Excellent customer support with a quick response. I have had to make some customization and all my questions have been answered and resolved quickly. The template is easy to edit and amend especially with the advice from the support team. Very customizable theme. I managed to do it exactly for my needs. Also, very fast and quality support which will solve your problems in a matter of the day. Highly recommended. 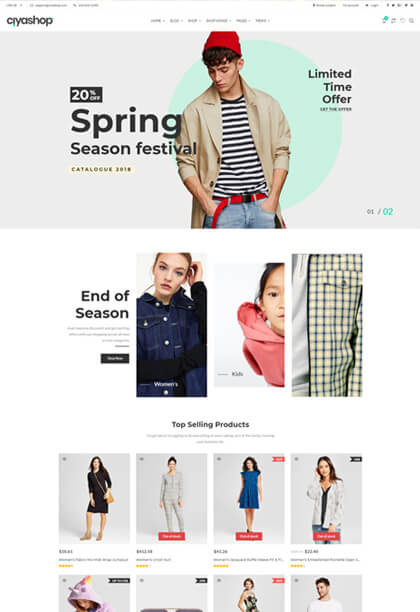 This theme offers a very clean and professional design with tons of features. The best Car Dealer theme you can find with a very professional support team! This is everything I wanted in a theme. From installation to inventory's to the finance calculator. It is easily administered to suit ,my needs. Still working with it and need to create all stock etx from scratch which is going to take some time even though it does feature CSV capability. Just a magic theme. Well done. No gripes from me. The things I did battle with seemed pretty hilarious when the solution was staring me in the face. Glad I haven't bothered support yet, but it is still early days. I think that everithing is 5 stars rating. I had a problem with some theme's feature and they solved it so 5 stars for design quality, for code quality, for customizability and so on, but... 6 stars for support. It is a really nice template and is working great with wpml. You don't need to customise css because there is a whole range of possibilities to change the template as you like. And also the support is fast and friendly. I love this theme. Not only does it look great, but for a novice it's extremely easy to set up, edit and manage. And when I do have an issue (that is, not knowing how to do something) the guys at Potenza are eager to help. I can't think of one bad thing to say about it. Great work guys! i just bought the template, and first i m reading documentation, opening the html, and ... i closed the doc and start to work on it, easy to read, easy to modify, all is commented, Nice work. The Corps theme is by far the best and most versatile theme out there! 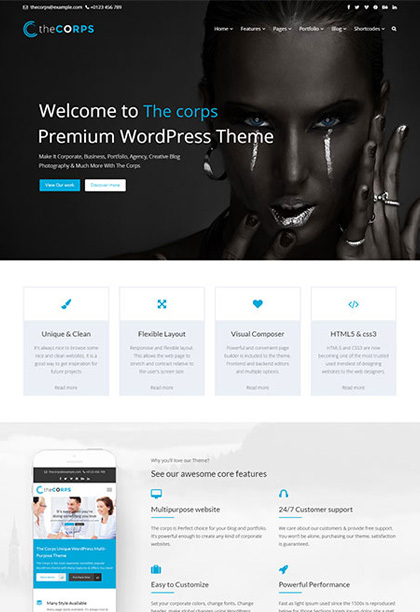 I have bought other themes from ThemeForest, yet they all pale in comparison to The Corps. I have bought it 3 different times to use when building my websites. Their code is very clean, their demo data has so many options and customization, and their support is incredible! They answer back within 24 hours, and go above and beyond with helping you out. I am more than pleased! I highly recommend them! I had a few things i needed help with on this template... Their customer service was amazing and helped me out two times.. They even went into my ftp and fixed something for me. How awesome of them! Thanks guys. It's nice to get an app which is connected with wordpress as a panel. I already make many tests, installing and uninstalling many times to see if the app and dashboard can really work fine without their help, but only making as doc says. It works fine. Good Job. I recommend this. When a job is well done, it is well done! Design quality : 4.5/5 Documentation : 5/5 Customizability : 5/5 And the best, SUPPORT : 6/5. I hope they're mores feature in the futur :) Just "BRAVO"! Ciyashop is a great application and I am completely satisfied with its design, code and flexibility. I was able to integrate the app with my existing woocommerce shop without any issue, thanks for the detailed documentation and amazing support from Potenza Global Solutions. Code is great and clean. Got my build done and app released within 24 hours. Minimum efforts required from my side. Support is great and they help instantly over tickets. Application is designed very nicely and conceptually. All the elements placed in a simple way, developer can customize without any documentation. The best part is support! I think quick and instant support are the key points when we think for pre-build application. Potenza Global Solutions team is very co-operative, very responsive to after sales support queries. Genuine and helpful team. I have got best support from them. I recommend Potenza Global Solutions for best customer support, design and code quality. Thanks! Great product very good designed and costumer support is also very well responsive. I have purchased many items so far but buying from here will be my best deal because I have just taken the product (android app) into Google Play Store very easily with even less effort. Thanks to codecanyon for providing such a great product and satisfying me, I will remain ever a good customer to you. All our items are built with customizability as the prime focus. Relish the freedom to combine sections and modules, change icons, fonts etc. Tired of standard looking items? Steer ahead of the competition with unique and clean designs crafted with attention to details. Gain access to our Support Forum post purchase where our team of developers are ready to help you through any obstacle faced during installation, customizations etc. We build our templates with the popular Bootstrap framework. As a result, your website will look perfect on any mobile device. Fast loading speed is a crucial element for search engine rankings and user experience. We make sure that our templates are optimized and SEO friendly. We continuously improve our themes and make them better. With regular updates, you’ll always get the latest version of your theme.